Dan Biggar is back in the starting 15 as Saints make eight changes to face Leicester Tigers at Welford Road on Friday night. Biggar returned from Wales duty earlier this week, having helped his country to claim a Six Nations Grand Slam. 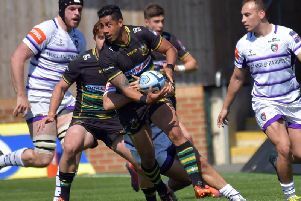 And he immediately steps in for James Grayson, who is not in the squad this week after being named man of the match in last Sunday's Premiership Rugby Cup final win against Saracens at Franklin's Gardens. Cobus Reinach comes in for Alex Mitchell at scrum-half, while Tom Collins is handed a rare start as he starts on the wing, with Ahsee Tuala shifting to full-back and George Furbank benched. Rory Hutchinson takes the place of Luther Burrell, who suffered concussion in the early stages of last weekend's win. In the pack, Francois van Wyk, James Fish, Jamie Gibson and Heinrich Brüssow replace Alex Waller, Reece Marshall, Tom Wood and Lewis Ludlam respectively. Ludlam is not in the squad as he is given a well-earned rest. Teimana Harrison will skipper Saints, with Waller and Wood both on the bench. Australian back Andrew Kellaway returns to the squad as he is named among the replacements. Leicester welcome back five of their England internationals for the Gallagher Premiership game. Manu Tuilagi, making his first appearance since agreeing a new contract at the club, is joined in the starting line-up by Jonny May, George Ford, Ellis Genge and Dan Cole on their return from Six Nations action. Ben Youngs is rested after taking a knock on England duty and Wales cap Jonah Holmes is also unavailable for the first Premiership fixture since the end of the Six Nations. But Tigers do welcome back Brendon O’Connor and Sam Harrison after injury. Guy Thompson lines up at No8 in the absence of Sione Kalamafoni, who starts a three-game ban following his red card against Sale Sharks in round 16.